One of the keys for us to maintain a healthy lifestyle is to have a healthy, balanced diet full of nutritious foods to avoid conditions like leaky gut, IBS, IBD, inflammation, joint pain, weight gain, brain fog and fatigue. It is important to track what is happening in your digestive system on a regular basis to ensure you are digesting your food properly to obtain the maximum benefit from what you eat. Symptoms that your digestive system is not working properly are: bloating, being prone to frequent sickness, stomach cramps, diarrhoea and constipation. By introducing healthy, gut friendly bacteria to your digestive system, you can help rebalance your intestinal flora to promote optimum digestive balanced and improved overall health. 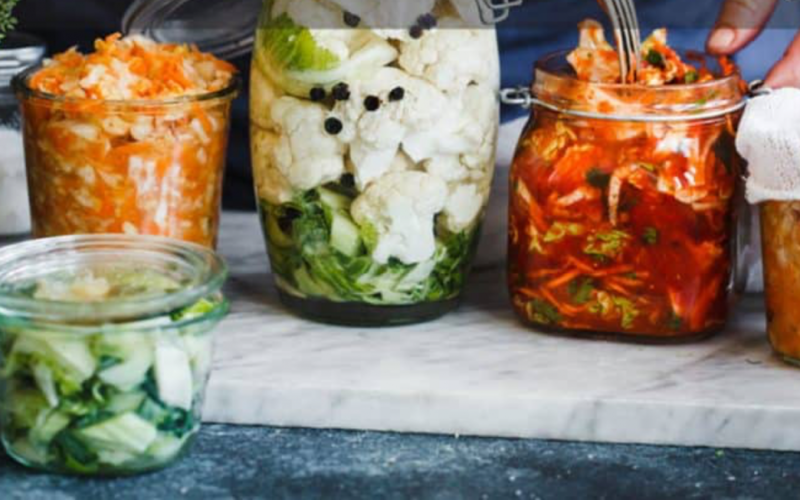 Introducing fermented foods into your daily diet can help you to heal any symptoms of digestive conditions, boost your immune system, ease inflammation, help you feel more energised and aid your sleep pattern so you sleep deeper and for longer. Fermented foods have existed for centuries and are popular all around the world due to the wide range of benefits they offer us, including the easier digestion of foods by breaking down raw food into more easily digestible parts and increasing nutrient absorption with gut friendly bacteria. In addition, fermentation serves as a very effective food preservation method without the necessity to freeze, dry, cure or can as it inhibits the growth of harmful bacteria. Fermented foods are also a great source of live Lactobacillus which is one of the most beneficial types of gut bacteria. Lacto-fermentation is one of the easiest and most popular fermentation methods for you to use at home to ferment fruits and vegetables all year round. In days of old it was an excellent method to preserve the summer harvests to eat during the long winter months when there were no fresh fruits and vegetables readily available to eat. Lacto-fermentation uses the beneficial bacteria present on the skins of fruits and vegetables which feeds on the naturally occurring sugars present in the fruits and vegetables. This stimulates the growth of more beneficial bacteria which then metabolizes the sugars and creates a lactic acid environment to ferment the foods in. Lactic acid creates an acidic and anaerobic (without oxygen) environment, in which healthy prebiotics and probiotics can thrive. It is important to keep the cabbage for sauerkraut, or the mixture of vegetables for kimchi, completely submerged beneath the vegetable liquid produced from the squashed cabbage and other vegetables. This is because exposure to oxygen would be harmful for the ferments you are creating as it would expose the ferments to pathogenic or harmful bacteria as well as possible mould spores which could contaminate and spoil your ferment batch. What is the difference between anaerobic and aerobic fermentation? The lacto-fermentation process creates lactic acid which can only be produced inside a completely anaerobic environment without any oxygen whatsoever. All the sauerkrauts, kimchis, chutneys and pickles that you ferment at home will rely on this anaerobic environment. Aerobic fermentation takes place when oxygen is present during the fermentation process. 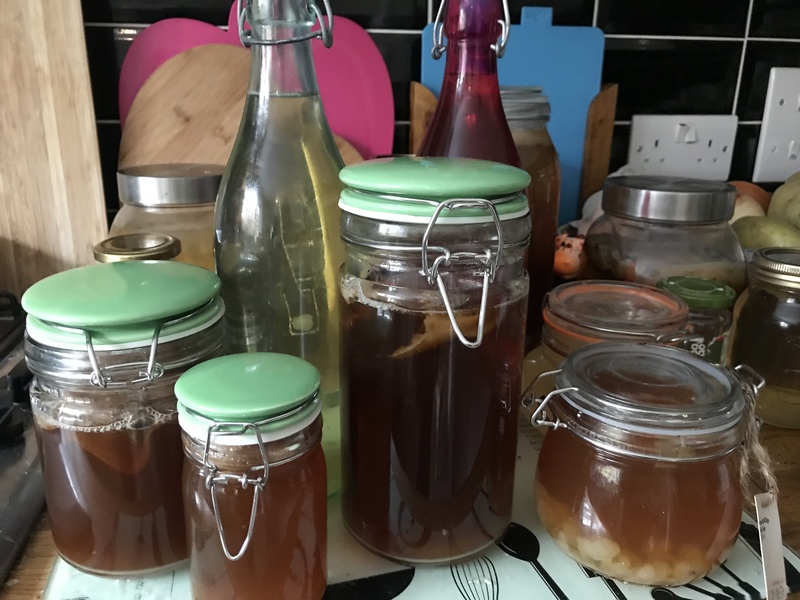 Popular fermented products such as wine, apple cider vinegar, beer and kombucha are all made in an oxygen rich environment in the early stages of fermentation which helps to develop flavour and to create the necessary pH levels. The sugars present are then converted into ethyl-alcohol. Why should we start with small batches of ferments? Fermenting foods is a spontaneous process which doesn’t always have the same outcome, so when you see large scale store bought fermented products such as sauerkraut, yoghurt or kefir with labels stating “made with active, live cultures”, this does not necessarily mean that the cultures are still live by the end of processing. So once a product hits the supermarket shelves it has often lost all the healthy benefits of active, live cultures. So do factory made ferments actually have any active probiotics in them? Factory production protocols of many foods rely on consistency and sterilization methods to ensure a longer shelf life which kills any live cultures during the heating process. Domestic fermentation is the absolute opposite of large scale production as it preserves the prebiotics and probiotics therefore creating a much healthier product to consume on a regular basis. Some small scale production store bought ferments continue to use traditional lacto-fermentation methods and are found in the refrigerated section in health food shops. In this case the labels will state that they contain live and active cultures and do not use high temperatures to pasteurize their products, thus preserving all the beneficial properties of small scale fermentation. The answer is no. The majority of the pickles available on supermarket shelves are stored in vinegar and have not actually been fermented. Using vinegar is a quick, tasty and easy way to pickle foods but it obviously lacks any of the probiotic or enzymatic benefits of fermenting. 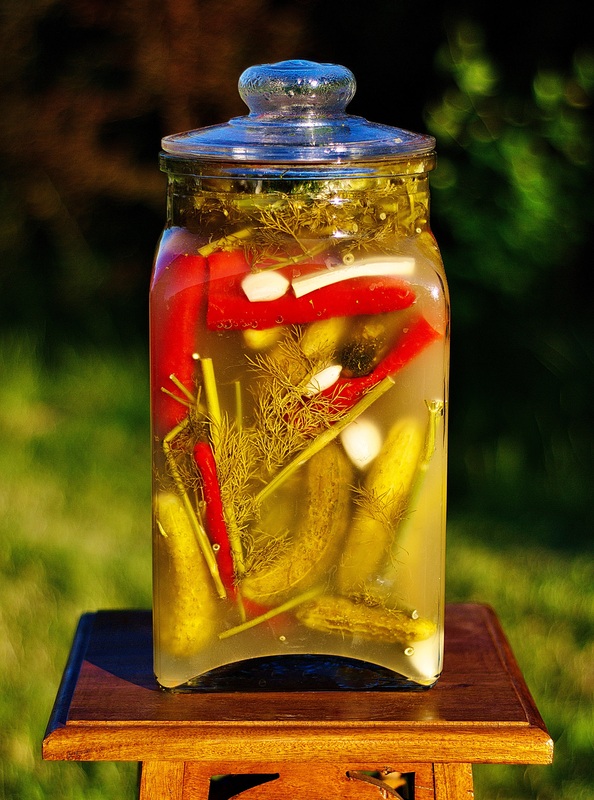 Traditionally fermented pickles, also called sour pickles, are fermented by using a simple solution of unrefined sea salt or pink Himalayan salt and clean, filtered, chlorine-free water. 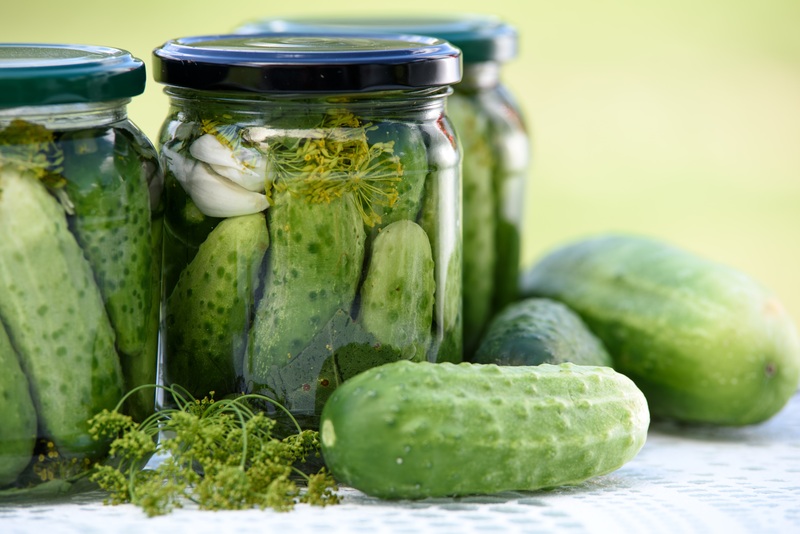 Lactobacilli are naturally present on the outside of cucumbers and other vegetables and create lactic acid which then pickles the vegetables. Here are some practical tips for you to try fermenting foods at home to introduce into your daily diet to boost your immune system and give you loads more energy! For simple recipes for traditional sauerkraut and beetroot and red cabbage sauerkraut click here…. Don’t be put off if it doesn’t all go absolutely perfectly the first time you make a batch of ferments. Fermentation is an art and can be a temperamental process at times. There are a lot of variables to consider, such as the ambient temperature of the room where you make and store your ferments during the fermentation process, or any possible contaminants such as bad bacteria or mould spores. The more you practise fermenting at home, the more you will learn about it and you can then adapt your recipes to your taste. Whether it means changing the amount of salt you use for taste or altering the amount of time you leave the jars to ferment. Hint: fermenting will happen quicker in the warmer and more humid spring and summer months of the year, but it requires more time in the colder, damper months of the autumn and winter. When you’re making sauerkraut or kimchi and there is a a clear or slight greenish hue coloured liquid floating at the top of your ferment, this is a natural separation of the liquid and is completely harmless, stir it in to the rest of the ferment. If your batch has a strong sulphurous smell or is slimy and mouldy with bright reds, brown, and blacks, throw it away. Somewhere along the way in the fermentation process oxygen has entered the container and disrupted the anaerobic environment. Be patient and keep going as you will get the hang of fermenting with a bit of practise!! When fermenting, always use high quality sea salt or pink Himalayan salt and unchlorinated, clean, filtered or distilled water. Processed salt which includes other ingredients will not work properly and wtaer full of impurities won’t aid the fermentation process either. 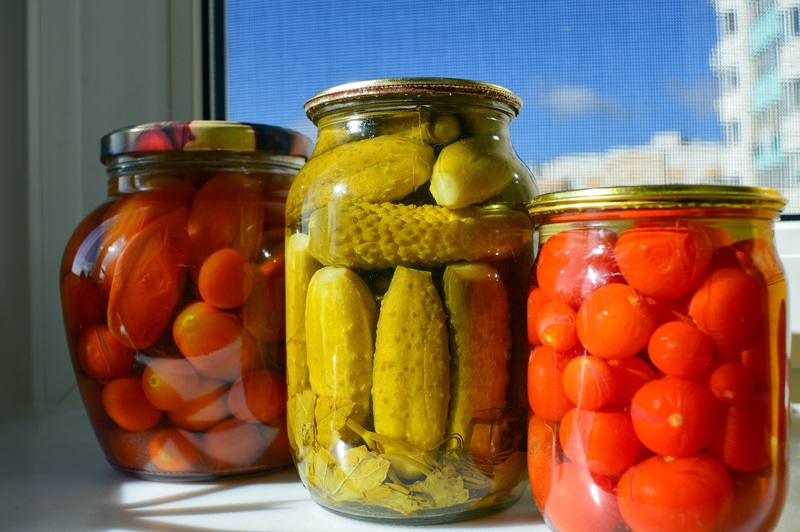 Using the appropriate equipment such as fermenting crocks, or Mason jars with sealed lids, weighted jars and jars with airlocks, is a much more foolproof method than attempting your first batch of ferments with random jars which might not seal properly letting in oxygen and ruining the process. It will help you feel more comfortable with the fermenting process before you start experimenting with your ferments and using alternative containers as you gain more confidence. Make sure you sterilize your containers before using them for the first time and remember to ‘burp’ the containers frequently during the fermentation process to release the built up pressure. It’s a great idea to taste your ferments as you go along so you have an idea of what stage they are at during the fermentation process. However the more you open the containers and expose your ferment to oxygen, the more it is at risk of exposure to bad bacteria and mould. Use clean, non metal utensils to sample your ferment, and always use clean utensils and clean hands to press and pack down your fruits and veggies below the brine level. Make sure that during the massaging process there is enough brine created to cover the fermented vegetables. By adding more salt to the vegetables at this stage it will help to draw out the liquid. It is vital that your ferments are always submerged beneath the liquid level while fermentation takes place so that they don’t develop bad bacteria with unwanted air exposure. It is basically a matter of trial and error. I would say less is more with the amount of salt you add to start with. Begin with a smaller amount of salt, then you can always add more salt during the fermentation process if necessary, remembering to stir round the fermented vegetable so the salt spreads round evenly. If your final product ends up being too salty for your taste buds, you can always add a small amount of clean, filtered water to take away some of the excess salt. Do not rinse the fermented food, since that will also rinse away the good bacteria that you have painstakingly created! By using vegetables which have been pre chilled in the fridge for a while so they are cold before you start fermenting will help to maintain a good texture to the fermented vegetables at the end of the fermentation process and improve their taste once fermented. Of course it is possible to eat your ferments just as they are, but you can also use your ferments as a condiment for another dish. Adding them to the top of your salads or eggs or incorporating them into your collard or lettuce wraps and using them as a side dish to go with chicken, steak or fish is a great alternative! 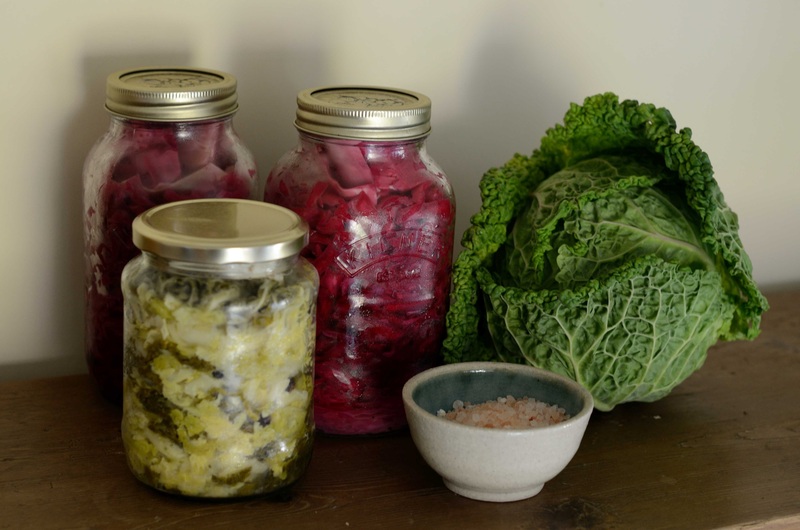 If eating fermented foods is a new thing for you, start with a little at once each day. Too much in one go can upset your digestive system till you adjust to it. As you learn to make different fermented foods like sauerkraut and kimchi and drinks like kefir and kombucha, you can gradually incorporate them into your daily diet.